It was a laid back, time changin' weekend around town! Complete with Matt getting an allergy shot, yum food, theater, meeting other veg folks, promoting and computer stress! Matt's computer is getting repaired so that means my zine is not going to be finished on my personal dead line. I print my hard copy on Matt's printer then go from there. It means I can fiddle with it more. Maybe make it a double issue at 40 pages! 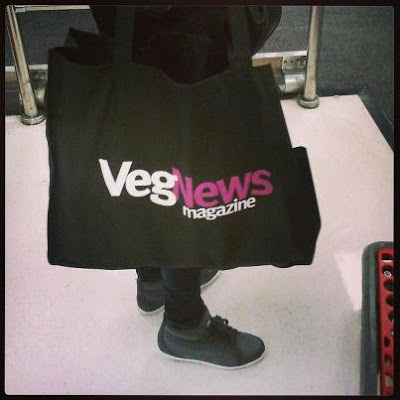 I am part of the Veg News street team, I get to promote a magazine I really dig by carrying this cool new bag and handing out copies of the magazine. Last week in my promo pack I got to try the new Go Max Go Tumbs Up bar - ohh yes! It was good!It reminded me so much of a Butterfinger! Vegan fashion fact: the shoes I am sportin' are vegan sneakers that contain faux snake skin, faux suede and faux fur. With all of the Beyounce shoe drama lately I feel the need to wear my cool cruelty free kicks! They are by Akademiks and were really cheap with a bunch of mark downs! I know some people think wearing faux is wrong but I am all for faux. I think it comes down to showing people you can celebrate animals cruelty free and educate the clueless or ill informed. Saying racist things about a celebrity or calling her names will not change her mind or anyone's mind for the matter. 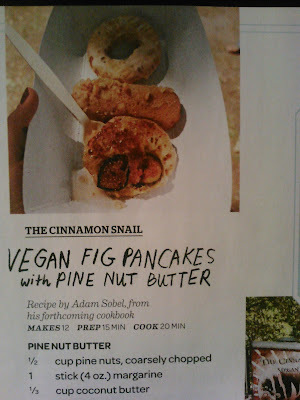 In my Veg News bag I had my usual Target vegan food haul that I stock up on weekly (Rotel, Luna bars, snacks, chips) but I also picked up the new issue of Rachel Ray because it featured the vegan food truck Cinnamon Snail plus a recipe for their fig pancakes! Awesome seeing vegan food in a mainstream non-vegan magazine! Camp 4 gave us a preview of a upcoming vegan sandwich on their new spring menu. It is a black bean hummus sandwich with black bean hummus, avocado, onion and a potato crisp (sorta like a thick slightly crisp waffle fry). Matt and I split the sandwich and salad (because Saturday is a sleep in day and we had a late lunch to begin with and would be eating dinner shortly). It was really good, fresh! 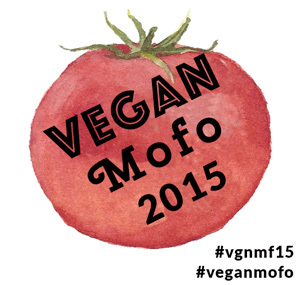 I am glad they are offering something vegan on the menu and hope they will put another vegan option or two on it! Also I ordered a french press of coffee and they had two almond milks to choose from! Matt does not even like coffee but totally dug on my mug and insists we get a french press. I am cooking up a lot of new food this week and can't wait to share! I hope your week gets off to a great start! That sounds like a great weekend. 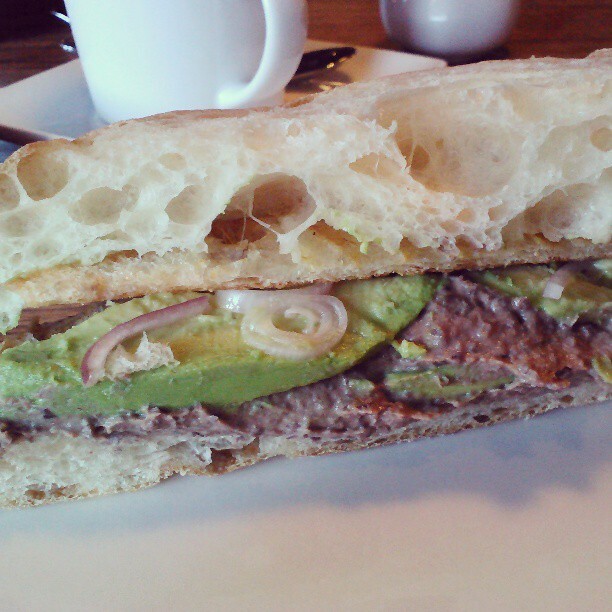 The bread on that sandwich looks so perfect! it is a yearly application, you watch the site. you apply, you wait months to see if they pick you.